The John and Becky Surma Dean of the Penn State Smeal College of Business oversees all aspects of one of the largest business schools in the nation. Smeal offers highly ranked programs to more than 5,000 students at all levels; supports the research activities of faculty members in six academic departments; is home to a network of leading research centers in business; and features an alumni network of more than 75,000 Smeal graduates around the world. Whiteman, who has more than 32 years of experience in higher education and business, assumed the leadership position at Smeal in July 2012. Prior to joining Penn State, he was senior associate dean for the Tippie College of Business at the University of Iowa, where he was responsible for undergraduate and graduate degree programs; faculty and staff recruitment; promotion and tenure; budgetary operations; college facilities; technology operations; and strategic planning for the business school. 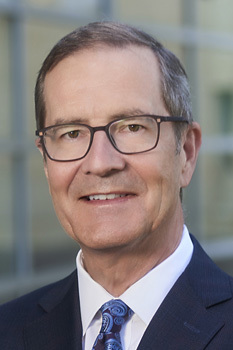 During a career that began as an instructor at Iowa in 1980, Whiteman advanced through the faculty ranks to become a chaired professor and served in a variety of administrative roles including chair of the Department of Economics, director of the Institute for Economic Research, and interim dean. Whiteman holds a Ph.D. in economics from the University of Minnesota and a bachelor's degree in economics from the University of Kansas. He has conducted research that has been supported by a number of grants from the National Science Foundation, published dozens of academic papers, written two books, and served as associate editor of several economics journals. He has also advised the state of Iowa's Department of Management on economic issues and served as a visiting scholar at the Federal Reserve Banks of Kansas City, Atlanta, Cleveland, and Minneapolis. Understand how macroeconomic events and policies affect the global economy and business decisions. Kasa K., Walker T. B., Whiteman C., "Heterogeneous Beliefs and Tests of Present Value Models." Review of Economic Studies, 2013. Haley M., Paarsch H., Whiteman C., "Smoothed safety first and the holding of assets." Quantitative Finance, 2013, www.tandfonline.com/doi/abs/10.1080/14697688.2012.713113. Haley M., Whiteman C., "Generalized safety first and a new twist on portfolio performance." Econometric Reviews, 2008, www.tandfonline.com/doi/abs/10.1080/07474930801960360. Kose M. A., Otrok C., Whiteman C., "Understanding the evolution of world business cycles." Journal of international Economics, 2008, www.sciencedirect.com/science/article/pii/S0022199607001328. Otrok C., Ravikumar B., Whiteman C., "A generalized volatility bound for dynamic economies." Journal of Monetary Economics, 2007, www.sciencedirect.com/science/article/pii/S0304393207000803. Walker T., Whiteman C., "Multiple equilibria in a simple asset pricing model." Economics letters, 2007, www.sciencedirect.com/science/article/pii/S0165176507000912. Foster F., Whiteman C., "Bayesian Prediction, Entropy, and Option Pricingx." Australian Journal of Management, 2006, aum.sagepub.com/content/31/2/181.short. Ayhan K., Otrok C., Whiteman C., "Understanding the Evolution of World Business Cycles." I1\/IF Working Paper WP O, 2005. Otrok C., Silos P., Whiteman C., "Bayesian dynamic factor models for large datasets: measuring and forecasting macroeconomic data." University of Iowa unpublished manuscript, 2003. Kose M., Otrok C., Whiteman C., "International business cycles: World, region, and country-specific factors." American Economic Review, 2003. Foster F., Whiteman C., "Bayesian cross hedging: an example from the soybean market." Australian Journal of Management, 2002, aum.sagepub.com/content/27/2/95.short. Foster F., Whiteman C., "Bayesian Prediction, Entropy, and Option Pricing in the US Soybean Market, 1993-1997." University of Iowa manuscript, 2002. Ravikumar B., Whiteman C., "Evaluating asset‐pricing models using the Hansen–Jagannathan bound: a Monte Carlo investigation." Journal of Applied …, 2002, onlinelibrary.wiley.com/doi/10.1002/jae.640/full. Otrok C., Ravikumar B., Whiteman C., "Habit formation: a resolution of the equity premium puzzle?." Journal of Monetary Economics, 2002, www.sciencedirect.com/science/article/pii/S0304393202001472. Otrok C., Ravikumar B., Whiteman C., "On the Equity Premium in Stochastic Discount Factor Models." (researchgate.net), 2001. Neely C., A Roy, Whiteman C., "Risk aversion versus intertemporal substitution: a case study of identification failure in the intertemporal consumption capital asset pricing model." Journal of Business & Economic …, 2001, www.tandfonline.com/doi/abs/10.1198/07350010152596646. DeJong D., Ingram B., Whiteman C., "A Bayesian approach to dynamic macroeconomics." Journal of Econometrics, 2000, www.sciencedirect.com/science/article/pii/S0304407600000191. DeJong D., Ingram B., Whiteman C., "Keynesian impulses versus Solow residuals: identifying sources of business cycle fluctuations." Journal of Applied …, 2000. Foster F., Whiteman C., "An application of Bayesian option pricing to the soybean market." American journal of agricultural …, 1999, ajae.oxfordjournals.org/content/81/3/722.full.pdf. Roberds W., Whiteman C., "Endogenous term premia and anomalies in the term structure of interest rates: Explaining the predictability smile." Journal of Monetary Economics, 1999, www.sciencedirect.com/science/article/pii/S0304393299000379. Otrok C., Whiteman C., "What to do when the crystal ball is cloudy: Conditional and unconditional forecasting in Iowa." Proceedings of the National Tax Association, 1998. Otrok C., Whiteman C., "Bayesian leading indicators: measuring and predicting economic conditions in Iowa." International Economic Review, 1998. Faust J., Whiteman C., "General-to-specific procedures for fitting a data-admissible, theory-inspired, congruent, parsimonious, encompassing, weakly-exogenous, identified, structural model to the DGP: A translation ." Carnegie-Rochester Conference Series on Public Policy, 1997, www.sciencedirect.com/science/article/pii/S0167223198000074. Faust J., Whiteman C., "Rejoinder to Hendry." Carnegie-Rochester Conference Series on …, 1997. Riezman R., Whiteman C., Summers P., "The engine of growth or its handmaiden?." (Springer), 1996. Ingram B., Whiteman C., "A Bayesian approach to calibration." Journal of Business & …, 1996, www.tandfonline.com/doi/full/10.1080/07350015.1996.10524625. Roberds W., Runkle D., Whiteman C., "A daily view of yield spreads and short-term interest rate movements." Journal of Money, Credit and Banking, 1996. DeJong D., Whiteman C., "Bayesian inference in dynamic equilibrium models: An application to the rational expectations model of the term structure.. : essays in honor of Arnold Zellner." 1996. Whiteman C., "Bayesian prediction under asymmetric linear loss: Forecasting state tax revenues in Iowa." Forecasting, Prediction and Modeling in Statistics and …, 1996. DeJong D., Whiteman C., "Trends and Cycles as Unobserved Components in Macroeconomic Time Series: a Bayesian Perspective." ADVANCES IN ECONOMETRICS, 1996. Riezman R., Summers P., Whiteman C., "The engines of growth in the APEC economies, 1950-1990." (Centre for International Economic …), 1995. Divakar S., Mathur S., Whiteman C., "BVAR as a category management tool: An illustration and comparison with alternative techniques." 1995, onlinelibrary.wiley.com/doi/10.1002/for.3980140304/full. Faust J., Whiteman C., "Commentary [on Grayham E." Mizon’s Progressive modeling of, 1995. David N. D., Beth F. I., Charles H. W., "Keynes vs. Prescott and Solow: Identifying Sources of Business Cycles Fluctuations." Marzo. Pág, 1995. Riezman R., Summers P., Whiteman C., "The engine of growth or its handmaiden." A Time-Series Assessment of …, 1995. DeJong D., Whiteman C., "Modeling stock prices without knowing how to induce stationarity." Econometric Theory, 1994, journals.cambridge.org/production/action/cjoGetFulltext?fulltextid=3177692. Ingram B., Whiteman C., "Supplanting the ’Minnesota’prior: forecasting macroeconomic time series using real business cycle model priors." Journal of Monetary Economics, 1994, www.sciencedirect.com/science/article/pii/0304393294900302. DeJong D., Whiteman C., "The forecasting attributes of trend‐and difference‐stationary representations for macroeconomic time series." Journal of Forecasting, 1994, onlinelibrary.wiley.com/doi/10.1002/for.3980130304/abstract. Backhaus K., Whiteman C., "The regional economic impact of the University of Iowa." Iowa City: Institute for Economic Research, 1994. DeJong D., Whiteman C., "Estimating moving average parameters: Classical pileups and Bayesian posteriors." Journal of Business & Economic …, 1993, www.tandfonline.com/doi/full/10.1080/07350015.1993.10509958. Riezman R., Tamura R., Whiteman C., "The Case for Convergence." Proceedings of the Business and Economic …, 1993. Dejong D., Whiteman C., "Unit roots in US macroeconomic time series: A survey of classical and Bayesian perspectives." New directions in time series analysis, 1993, link.springer.com/chapter/10.1007/978-1-4613-9296-5_4. DeJong D., Whiteman C., "More unsettling evidence on the perfect markets hypothesis." Economic Review, 1992. Nankervis J., Savin N., Whiteman C., "Integration versus trend stationary in time series." Econometrica: Journal of …, 1992. Roberds W., Whiteman C., "Monetary aggregates as monetary targets: A Statistical Investigation." Journal of Money, Credit and Banking, 1992. Nankervis J., Savin N., Whiteman C., "The power problems of unit root test in time series with autoregressive errors." Journal of …, 1992, www.sciencedirect.com/science/article/pii/030440769290090E. Riezman R., Whiteman C., "World business cycles." (ideas.repec.org), 1991. DeJong D., Whiteman C., "On robustness." Journal of Monetary Economics, 1991, www.sciencedirect.com/science/article/pii/030439329190053Q. DeJong D., Whiteman C., "Reconsidering ’Trends and random walks in macroeconomic time series’." Journal of Monetary Economics, 1991, www.sciencedirect.com/science/article/pii/030439329190051O. DeJong D., Whiteman C., "The case for trend‐stationarity is stronger than we thought." Journal of Applied Econometrics, 1991, onlinelibrary.wiley.com/doi/10.1002/jae.3950060409/abstract. Dejong D., Whiteman C., "The temporal stability of dividends and stock prices: Evidence from the likelihood function." The American Economic Review, 1991. DeJong D., Whiteman C., "Are output fluctuations transitory? A Bayesian perspective." (Working paper), 1990. Whiteman C., Roberds W., "Monetary aggregates as monetary targets: A statistical investigation." (ideas.repec.org), 1990, ideas.repec.org/p/fip/fedawp/90-7.html. Riezman R., Whiteman C., "Worldwide persistence, business cycles, and economic growth." (ideas.repec.org), 1990. DeJong D., Whiteman C., "Trends and cycles as unobserved components in US real GNP: A Bayesian perspective." Proceedings of the American Statistical Association, 1989. DeJong D., Whiteman C., "Trends and random walks in macroeconomic time series: A reconsideration based on the likelihood principle." Journal of Monetary Economics, forthcoming, 1989. Whiteman C., "Problems in Macroeconomic Theory: Solutions to Exercises from Thomas J. Sargent’s Macroeconomic Theory, Second Editon." (getcited.org), 1987. Whiteman C., "Analytical policy design under rational expectations." Econometrica: Journal of the Econometric Society, 1986. Whiteman C., "Spectral utility, Wiener-Hopf techniques, and rational expectations." Journal of Economic Dynamics and Control, 1985, www.sciencedirect.com/science/article/pii/0165188985900053. Hamilton J., Whiteman C., "The observable implications of self-fulfilling expectations." Journal of Monetary Economics, 1985, www.sciencedirect.com/science/article/pii/0304393285900418. Whiteman C., "Lucas on the quantity theory: hypothesis testing without theory." American Economic Review, 1984. Whiteman C., "Linear rational expectations models: a user’s guide." (books.google.com), 1983. Bain I., Whiteman C., "The Macroeconomic Effects of Oil Price Increases: A Critical Review." (Resources for the Future), 1982. Whiteman C., "A Note on the Usefulness of Frequency-Domain Estimation Techniques." Univ. of Iowa Working Paper, 1982. Turner T., Whiteman C., "Econometric policy evaluation under rational expectations." Quarterly Review, 1981. Whiteman C., "A new investigation of the impact of wage and price controls." Federal Reserve Bank of Minneapolis Quarterly …, 1978.